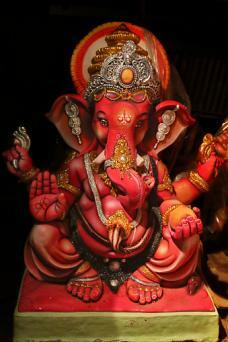 A Ganesha statue is an excellent feng shui tool for removing obstacles and attracting wealth and success. Even though Lord Ganesha (also spelled Ganesh or Ganesa) is a Hindu god, many feng shui practitioners opt to step outside the traditional Chinese symbols to use this iconic Buddhist deity statue. There are specific feng shui rules for a Ganesh statue placement in homes that you'll want to follow. You can place a Lord Ganesha idol for your home in an auspicious sector or location in your home to dissolve obstacles, offer protection, and assist in your personal and spiritual development. Ganesha worshippers create an altar and present offerings, such as a bowl of rice. The most ideal placement is in a meditation room in the northeast sector of your home. However, feng shui offers a few options for using this deity to remove obstacles and bring prosperity. Always set the statue so it is facing into the room and never towards the outside of your home or facing a door or window. Never use more than one Ganesha statue in a room. It is considered very inauspicious to have more than one Ganesha statue. The statue should never have its backside to a room. This brings poverty to the house. Lord Ganesha's duty as the doorkeeper for his mother's chambers made this statue a cherished placement for the main door. His presence offers protection and wards off ill or bad luck attempting to enter the home. Place a statue above the main door to bring prosperity into the home. Set this statue facing into the home for inviting progress into your life. If you live on a dead end street, place this statue in the foyer or main entrance area to deflect the inauspicious location of your home. The deadened road creates a poison arrow with the chi energy rushing at your home. You can place a Lord Ganesha statue in your home office to attract auspicious energy for your career. Place the statue so it isn't facing the door leading out of your office or window. This is an especially excellent location for this statue if you are facing challenges and obstacles in your career and life in generally. Lord Ganesha is believed to bestow good fortune in both personal and professional endeavors. Choose one of the auspicious directions for your statue to face. Set a Ganesha statue in this area of your home, choosing one of the auspicious directions in the corner of the living room. Select a place of honor, such as a bookcase shelf (at least eye level or higher). You might decide that a table is an ideal place for your statue. Don't set the statue on a hearth or beside a TV. There should be a sense of reverence for the place you select. Be sure to set the statue along an outer wall of your room and not a wall that separates one room from another (inner wall). The statue should face into the room and never towards a door or window. The dining room is a room that generates abundance and some feng shui experts advise placing deity statues in this area of the home to multiply that abundance. A curio in the northeast, north or west corner of the dining room can be used to display your statue of Lord Ganesha. If this isn't possible, select a respectful place where he can watch over and bless the nourishment of your family and guests. The ideal directions are the west, north, or northeast. When possible place the statue so it is faces north where Shiva resides. The statue should always be placed on an outside wall with its back to the wall, never facing an outside wall. The northeast sector is ideal for educational obstacles, knowledge and to attract prosperity. Bathrooms: Avoid placing this statue in the bathroom since this a room with inauspicious energy generated from waste water. The statue should not face a bathroom door or wall. Bedroom: Deity statues are not usually placed in a bedroom. Garage: Never set a Ganesha statue in a garage since this is considered an inauspicious and vacant place. Laundry room: Don't set a Ganesha statue in a laundry room since the energy here is similar to that of a bathroom with much waste water. Kitchen: Never place an idol in the kitchen. This too is an area where waste water from dirty dishes, leftover or spoiled foods are disposed. Underneath staircase: In feng shui the space underneath a staircase is stagnant and considered very inauspicious. The only things that should be stored here are cleaning products or similar items, but never anything of value. 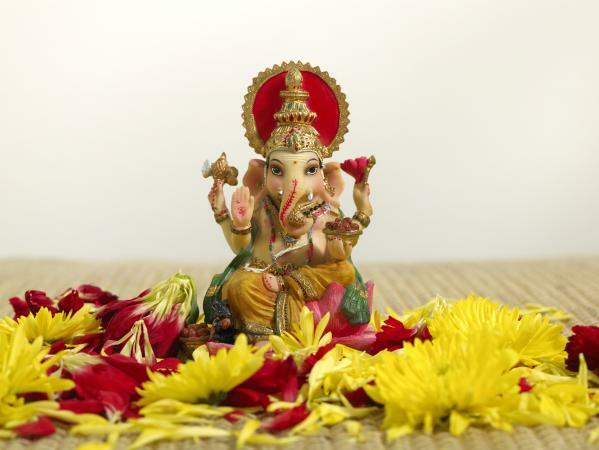 Floors: Never set the statue of Lord Ganesha on the floor or a lower placement. Give this statue a place of honor and respect. A table or cabinet is ideal where the statue is elevated. The standing pose is called Abhanga and refers to the rigidity of the pose showing no bending of the body. Often Lord Ganesha is featured with one foot resting on the mouse (his vehicle) and the other foot planted firmly on the ground. The reference to this pose is to maintain a "correct attitude" and to be unwavering in that mandate. In feng shui, You can use this pose for a home or business office. It is beneficial for someone currently in or assuming a position of authority to bolster that position and aid in guiding and leading others, especially by example. This statue often features Ganesha either sitting on a throne or on a lotus flower. The left leg is usually bent on the seat and the right leg down with the foot planting on the ground. Some statues feature Ganesha sitting cross-legged as in a yoga meditation pose. This represents a half-state of meditation, similar to sleeping with one eye open. Ganesha is keeping a watchful eye on those he oversees. Place in one of the auspicious directions, such as west, north or northeast. The reclining post is symbolic of luxury, prosperity, and wealth. This statue is considered as more of a home decor choice than a religious one. It can be used to represent a desire for these three material things or as a way to remove obstacles for achieving these. Another use might be a more spiritual one of overcoming such material desires. 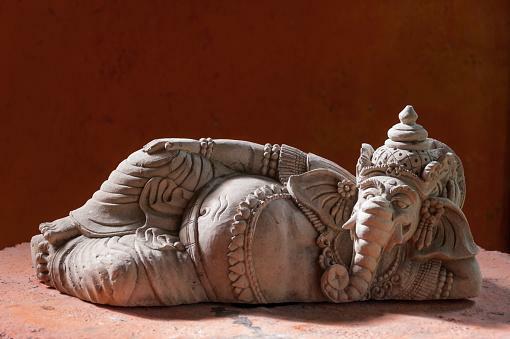 You can place the reclining pose Ganesha in your home office, living room, or one of the auspicious directions. This pose is often referred to as the dance of destruction since Ganesha is gracefully dancing despite his size and usually is dancing on top of the mouse (his vehicle). However, the mouse supposedly understands the power of Lord Ganesha and submits in order to receive Ganesha's blessings. Place in home office to dissolve career related obstacles, family room for any other obstacles, and use the compass directions for specific areas. These include west (children luck), north (career luck), and northeast (educational/knowledge luck). Lord Ganesha is an auspicious symbol with a rich history filled with many stories about his origins and gifts. He's most revered as the Remover of Obstacles. Devotees pray to him for the removal of the smallest to the largest obstacles they face. Feng shui practitioners might recommend a Lord Ganesha statue to overcome obstacles, such as obtaining that next level in a career or winning a college scholarship. In traditional feng shui, the elephant is an auspicious symbol that trumpets success and abundance and might be the reason Lord Ganesha is often embraced for feng shui use. There are many stories about Lord Ganesha's origins. Some stories place him as the natural son of Shiva and Parvati. Ancient texts claim he was created by Shiva while others state he was created by Parvati. Still, other ancient texts tell how Shiva and Parvati found Ganesha and claimed him as their son. Just like the stories of Lord Ganesha's origins, the explanations for his elephant head are just varied. One of the most popular stories is that Parvati created a boy (claiming him to be her son) to stand watch and protect her privacy while she bathed. Returning from battle, Shiva was blocked entry into his home by the boy. Outraged, Shiva severed the boy's head from his shoulders with his sword. In an effort to appease a distraught Parvati, Shiva ordered his men to set out from the palace and take the head of the first living animal they came across that was facing north. That animal was an elephant. Shiva attached the elephant's head to the boy's body and brought him back to life. Lord Ganesha became the symbol of overcoming obstacles, and one of wisdom through the acts of listening and reflecting on issues. These gifts are believed to be imbued to those displaying his statue. 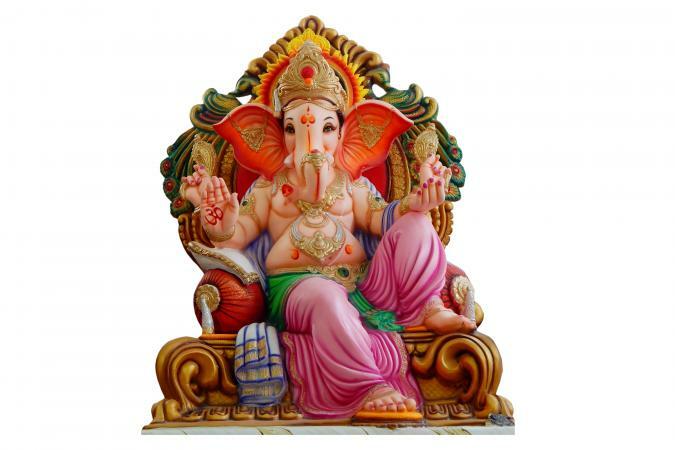 Once you decide where you wish to place your Lord Ganesha statue, be sure to refer to the Vastu guidelines. The mindful placement of a Lord Ganesha statue will ensure it becomes an auspicious feng shui application.